In 1919 coal baron Francis Stuyvesant Peabody commissioned renowned Chicago architect Benjamin Marshall to design a Tudor Revival-style mansion on his property west of Chicago. Today, the building stands as Mayslake Hall, part of the Forest Preserve District of DuPage County’s Mayslake Peabody Estate in Oak Brook. It’s on the National Register of Historic Places and offers tours, lectures, concerts, art classes, exhibits, theatrical performances and space for private events throughout the year. For the past 20 years the District has been working to restore the 39-room estate to its original grandeur, but there is much yet to be done. 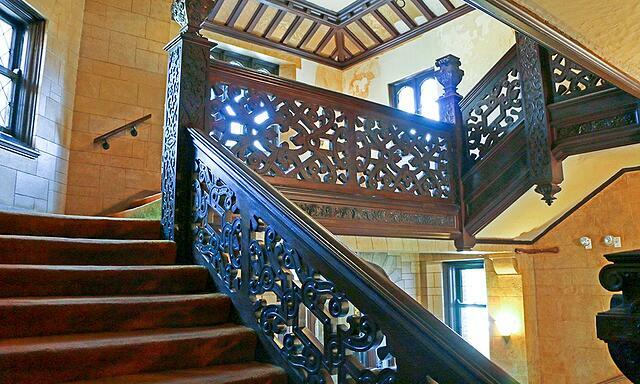 Mayslake Hall features a central walnut staircase with fantastic features, including wooden stairs, landings with bay windows and latticed panes and vaulted ceilings that recreate a medieval atmosphere. The staircase has survived almost 100 years in its near-original condition as the single most important architectural feature of the hall. Mayslake Peabody Estate recently announced plans to restore the staircase, including work to repair and refinish the woodwork on its stairs and balustrade and the installation of a period-appropriate runner. Two generous donors have already pledged to match the first $10,000 raised dollar for dollar, but additional cooperative fundraising efforts will also be necessary. The Friends of the Forest Preserve District is joining these efforts by agreeing to raise $43,815 for the staircase restoration, and your donation can help preserve this historic feature for future generations to enjoy. 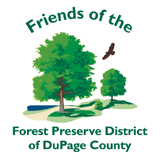 Thank you for choosing to support the Friends of the Forest Preserve District of DuPage County! If you wish to keep your donation anonymous, please inform Fundraising & Development at 630-933-7097 or fundraising@dupageforest.org.